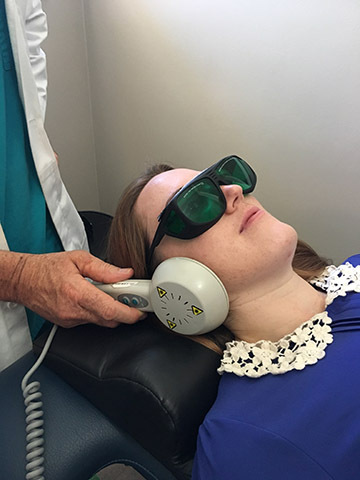 Photobiomodulation, or what is more commonly known as laser therapy is a well-established painless modality which is primarily used for inflammation control and tissue repair. This mode of therapy is safe, painless, and comfortable for patients of all ages during treatment. Photobiomodulation is increasing in popularity among top level athletes for a drug free alternative for pain relief and injury recovery. Photobiomodulation is used by athletes and medical patients alike to promote tissue repair and recovery. The treatment uses low-power lasers to safely reduce inflammation and enhance cell function, promoting acceleration of their natural processes. Research has shown its effectiveness for traumatic brain injuries and strokes among other brain conditions.